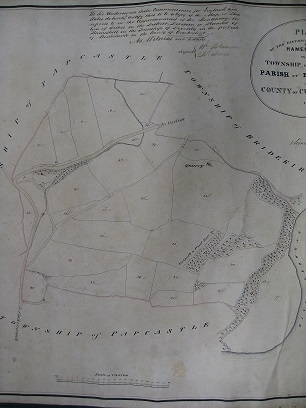 The ‘Hamlet of Hameshill’ is shown on the 1840 Tithe Map, fig.1. To establish the boundaries relative to modern buildings and roads it is highlighted on a (pre by-pass) OS map in fig.2. An archaeological survey in late 2013 noted signs of buildings in field 6 on the Tithe Map (number 6 on the map is indistinct – it is to the east of field 1). A review of historical sources has shed some light on past buildings in this area. Thomas Donald’s map of 1774 (fig 3) assigns the name Hames Hill to a house where the building stones and hints of wall lines were observed. Comparison of the two maps shows the Roman/medieval road to Bridekirk and Carlisle in use in 1774, replaced by the turnpike road before 1840 (c. 1825). ‘Hill Top’ on Donald’s map, fig 3, lies outside the Hamlet of Hames, close to where Derwent Lodge was built in 1846 – the latter house was rather misleadingly renamed Hames Hall sometime between 1871 and 1881. Being outside Hameshill and a relatively recent naming without any evident historical basis, Hames Hall is not relevant to the history of Hameshill. On the origins of ‘Hames’ as a place/field name, ref.1 states: ‘this can hardly be other than the northern plural of the Old English ham’. Ham, singular, is a common suffix meaning settlement or homestead as in Brigham. Hamm equates to enclosure, as in Dearham. 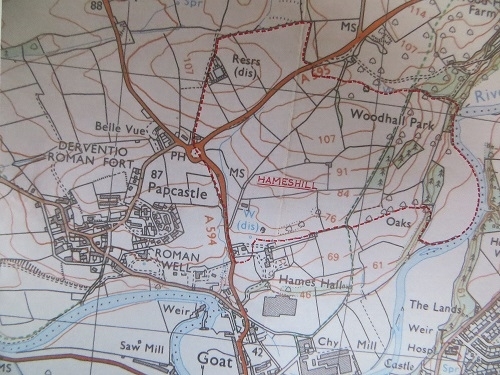 The place name Hames seems to be unique in Britain; if the derivation was from either homesteads or enclosures it ought to be common. It may be, therefore, that the place name derives from the personal name Hames which was, supposedly, Norman, introduced into England after 1066. ‘Adam held Le Hames in Papecastre: a messuage and 100 acres of land, held of the king in chief as of the barony of Alredal by service of 2s yearly’. (He also had holdings in Setmurthy and Lorton.) This indicates that Hames was a freehold estate, independent of neighbouring manors and that the del Hames family was, to some degree, nobility rather than tenant of a manorial lord. (An IPM was a local enquiry into the lands held by deceased people of status, i.e ‘tenants in chief’ who held land directly from the king, in order to discover whatever income and rights were due to the crown.) The term ‘messuage’ (i.e.‘that area of land taken up by a house and its associated buildings and land’) and the ‘of the Hames’ family name indicate that there was a residence of status on the estate before 1315. There are indications of a rather earlier date than 1315 for this occupation at Hameshill. Lambert de Multon made an (undated) award of iron ore from his mine to the monks of Holme Cultram, with Reginald del Hames included in the list of witnesses (3). The de Multon family arms appear above Cockermouth Castle gate house. Lambert had died by 1247. Reginald del Hames was, therefore, ‘in business’ before 1247 and, presumably the Hameshill estate and residence also predate this time. It is relevant to consider the ‘100 acres of land’ attached to ‘Le Hames’. The customary acre depended on the perch length used – most commonly in Cumberland one customary acre was equivalent to 1.62 statute acres (4). The schedule to the tithe map, transcribed in Appendix 1, gives Hames Hamlet as 163 statute acres (almost exactly 100 x 1.62). Is this a surprisingly accurate indication that the estate boundaries had not changed, or pure chance? The Registry of the Priory of St. Bees (5) records the gift of property in Whitehaven to the Priory by John del Hames in 1331. An editorial footnote in this 1915 reference dismisses ‘Hames Hall’, in this context, as a modern renaming. A later John del Hames was a ‘man-at arms’ defending Carlisle Castle against Scottish raids in 1383/4 (6). ‘John del Haymes and Stephen Barwis hold freely their land of Haymes with common of pasture by service of 2s per annum for all services and fealty’ (7). The family connection between del Hames and Barwis is not known but by 1398 Hames was held by Stephen Barwis alone (8). There is no evidence to prove that del Hames family members were themselves still living at Hames in the late 14 C, nor is there any reason to suppose that a Barwis ever took up residence. The relevant branch of the Barwis family held a tenancy at Islekirk (in the parish of Westward), owned by the Abbey of Holme Cultram, before the Dissolution, and acquired the freehold in 1544 (9). Richard Barwis inherited the land at Hameshill i.e. ‘two messuages with sixty acres of land, twenty acres of meadow, twenty acres of pasture’ (100 acres total), as well as other manors and property, on his father’s death in 1616. He was a notable figure in the county, being MP for Carlisle for many years and played a prominent part on the Parliamentary side in the Civil War. After Richard Barwis died (without issue) in 1648, his widow Frances held Hames, Islekirk and other property until her death in 1670. Richard had made provision to ensure continuing Barwis family possession by conditional sale in 1647 to his uncle, John Barwis of Waverton, and his cousin, Thomas Barwis of Wolsty Castle (9). No further information has yet been found regarding Barwis interest in Hameshill after 1670, or when the Bromfields and Huttons were fully enfranchised. Hameshill in 1647 comprised a house and land (i.e. a ‘messuage and tenement’) in the occupation of Thomas Brumfield, and a second house and land occupied by Robert Hutton (10). Each paid 26s 8d yearly rent. At 50 customary (80 statute) acres each these represent large holdings for the period, able to support extended families but also requiring a significant work force. The Huttons were at Hameshill in 1626 (14), and probably well before, the family being recorded in the Bridekirk Parish Registers from the start of the records in 1585 (11). The name ‘John Brumfield of Hayms’ appears in the Papcastle Manor Court records for 1526, and Brumfields also figure in the Bridekirk Registers from the outset (11). The Brumfield house appears to have been replaced by what became known as Hames Hill House, in field 6 on the tithe map (fig. 1). The field name corresponding to no. 5 on the map (App. 1) is ‘Hutton Croft’ (the word ‘croft’ indicating land with a house), placing the second Hameshill ‘messuage’ here, alongside the ‘Stack Yard’, number 28 on the Tithe Map. Pinpointing the del Hames house of the 13th/14th centuries is clearly more of a problem. It may have been on one of the two sites noted above, or perhaps in ‘Round Close’, field 35 in fig. 1. The shape of the enclosure, on the edge of the estate, suggests an early date, and a nearby well (‘disused’ on later maps) would be consistent with there having been an early house here. Two houses now standing in this SW corner of Hameshill (Hames Hall Gatehouse and Little Hames) are relatively modern. While considering field names on the Tithe Map, Little and Great Goodison (36 &37) to the W and E of the road up Goat Brow give the impression that this was a single field before being cut by a road development. The route to the east past ‘Hames Hill’ shown in fig.3 may be the original line. The Brumfields, the plague and the Senhouses. Given the size of their land holding it may be expected that the Brumfields would have been moderately prosperous, with a house/ farm of some status. Several Brumfield wills, with inventories, exist for the parish of Bridekirk, dating between 1574 and 1631. Only the will of Thomas Brumfield Senior ‘of Hameshill’, indicates the dwelling place (12). In the main his will is typical of a Cumberland farmer of the time – value of goods and chattels (not land or property) being £31 12s 2d. ‘One bed with bed clothes in the bower’, value 10s, indicates the traditional simple farmhouse with the ‘master bedroom’ on the ground floor next to the ‘firehouse’. His two other bedsteads (value 5s) would have been in the loft above. The limited livestock (one stott i.e. a bullock, one heifer and a few sheep to the value of 22s) suggests the main farming activity is already in the hands of Thomas Brumfield Jr., aged 31 at this point. ‘One ark in the barn’ is the only reference to farm buildings. The first item in the will may be an indication of wealth/property, ‘I give unto my son Thomas Broomefield all my right and free houses in Cockermouth’. No clarification of what this refers to, or the value, has been found – it may just be a catch-all phrase to cover property in the general area, including Hameshill. The will/ inventory of John Brumfield, died 1574, gives a better indication of farming activity in this area in the period (13). Quite possibly relating to Hameshill, it could be the inventory of the ‘John Brumfield of Hayms’ named in the 1526 Papcastle Manor Court records mentioned above. John’s will and inventory indicate that his four oxen were used for draught purposes, including ploughing. Neighbours with small land holdings unable to support an ox team of their own, paid for their services – several outstanding payments ‘for plowing’ were listed in JB’s will. Crops grown included barley, oats, hemp and flax. He had sheep, cattle and a horse for personal transport. Richard Barwis part-enfranchised Thomas Hutton (along with his tenants at Whinfell) in 1626 for a payment amounting to 40 years ancient rent (14). Other tenants’ terms and conditions were similarly modernised in subsequent years (15), presumably to raise money. Sooner or later this will have included the Brumfields. Cumberland’s last ‘visitation’ of the plague occurred at Hameshill (& Papcastle perhaps) in 1647, although minor in terms of total number of deaths compared with 1597/8 and 1623 episodes, it devastated two families (16). 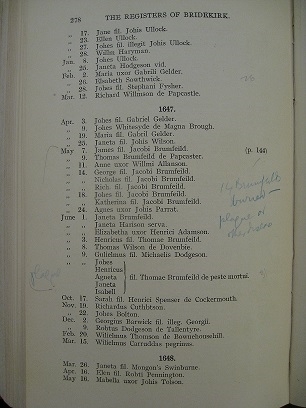 The Bridekirk Parish Register shows that 13 Brumfields were buried during May and early June, six being the children of James (Jacobus) and five the children of Thomas – see fig. 4. It is only certain that Thomas and his family lived at Hameshill; James and his family may have done. Two of Thomas’s family survived the plague, his wife Jane and daughter Elizabeth, aged 18 or so. The latter was married to Henry Dalton II (son of Henry Dalton I, gentleman, of Brigham and ‘The Fitz’) and away from home. As the only surviving child of Thomas Brumfield she would inherit his Hameshill holding, her mother being allowed to live there during her lifetime. Henry Dalton II died sometime before 1655, the year in which Elizabeth married Patricius Senhouse, a younger son of the Netherhall family (17). Elizabeth’s son Henry Dalton III, in return for much needed cash, made his will in favour of his mother, rather than his sister Jane, should he die before producing an heir. Such was the case, and both the Hameshill and The Fitz properties came into Senhouse possession. Elizabeth and Patricius built a new house befitting local gentry at Hameshill, around 1665 – the one shown on Thomas Donald’s map of 1774 (18,19). The Bridekirk Registers record the baptisms and deaths of the Senhouses of Hameshill up to the death of Humphrey, grandson of Elizabeth, in 1768. Writing in 1878, William Browne recalled from his youth the derelict house before it was demolished. The stone was reused in the 1839 rebuilding of The Fitz with the 1665 Senhouse arms & date stone being incorporated into the new building. The style of the Senhouses’ Hameshill house was, reputedly, similar to Wordsworth House in Cockermouth (19). The nonconformist Congregational Church, established during the Commonwealth period, was heavily persecuted following the restoration of the monarchy (Charles II) in 1660. George Larkham, the first pastor of the Independents, the incumbent from 1651 of All Saints Church, Cockermouth, was ‘ejected by the violence of Sir George Fletcher’ in 1660. The Hutton house at Hameshill became an important venue for clandestine meetings, services, baptisms, etc. (20, 21). Robert Hutton, son of Thomas, died in 1661.Thereafter Robert’s widow, Margaret, a staunch supporter, risked severe retribution by allowing her house to be so used. The Congregational Church records make frequent reference to this, e.g. in 1668 ‘Many other meetings the church had this yeare at the House of sister Hutton at Hemshill, and at the Hall at Tallentyre, but under great threatenings’. In 1670: ‘A pretty part of the church met at the house of our sister Hutton at Hemes-Hill. We met in the night for feare of the hunters abroad’. The size of the gatherings (20 stated on one occasion) and durations of 6 hours or more, suggest the Hutton residence was by this time more than a basic farm house. Charles II’s Declaration of Indulgence of 1672 suspended the laws against dissenters, permitting use of registered locations for worship. Margaret Hutton’s Hameshill house was the first in the Cockermouth area to be officially licensed. Charles was forced by Parliament to withdraw his declaration in the following year and the former persecution resumed. References to meetings at Hameshill ceased in 1676. Margaret Hutton died in 1678. (Margaret’s maiden name having been Dalton, it seems likely she would have been related through marriage to Elizabeth Senhouse, nee Brumfield). The Hearth Tax records for Dovenby (ca. 1670) list Richard Hutton, gentleman, as having a property with two hearths (22). (Hameshill was a detached part of the Township of Dovenby for local government purposes until 1887, when it was incorporated into the Civil Parish of Bridekirk). Two more references imply that the Hutton house at Hameshill survived in Richard’s ownership until the late 17 C. Thomas Denton (‘A Perambulation of Cumberland 1687-88’, 23) records that ‘Hames-hill lyes a little east (of Papcastle) where Mr Senhouse & Mr Hutton have two good freehold estates, each of them being worth £40 a year at least, and good seates’ (i.e. good houses). 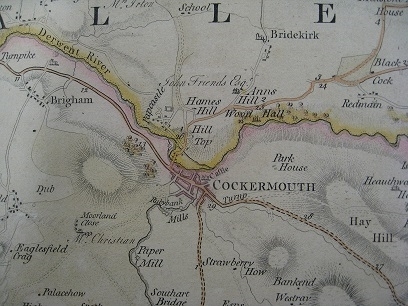 An issue over the repair of the Cockermouth – Bridekirk road at Fowle Flosh appeared in the records of the Quarter Sessions of the Cumberland Court – in the Easter Petitions 1693 it was stated that the road ‘belonging to Mr Richard Hutton and Mrs Senhouse of the Haimeshill is now repaired’ (24). Fowle Flosh was at the northern end of the medieval (Carlisle) road through Hameshill (fig. 1, field 39). Richard Hutton (baptised 1614) was the son of Thomas, and presumably inherited the Hameshill property either from his elder brother Robert, or Robert’s wife Margaret. No further record of Richard, or other Huttons of Hameshill, has been found. Neither does it appear, from the Bridekirk Registers, that another family became established. Other than the Senhouse family only seven Hameshill baptism entries, with six different family names, occur between 1688 and 1788 – possibly servants/employees of the Senhouse family (Appendix 2). The evidence would suggest that the Hutton land at Hameshill was in the hands of others by the start of the 18C and the house uninhabited. The 19th century references (19,20) show that ‘Hutton Croft’ as a farmstead was, even at that time, completely forgotten, with its ‘memorable events’ wrongly attributed to the Senhouse’s Hames Hill House. By the 21st century this house too was forgotten and the events presumed to have occurred at Hames Hall (21)! Hameshill, or Hames, between Papcastle and Bridekirk manors, had a long history as an independent estate of del Hames then Barwis ownership. The location of an early 13/14th century house, that of the del Hames family, is unknown. In the late medieval/early modern period Hameshill comprised two farmsteads, of which virtually nothing now remains above ground level, occupied by the Brumfield and Hutton families. Each was associated with locally significant historic events: reputedly the last visitation of the plague in Cumberland (as a result of which the Senhouse family acquired the Brumfield half of Hameshill) and the use of the Hutton’s house for nonconformist church purposes during a period of persecution and repression. The Senhouses’ Hames Hill House, built 1665, was demolished around 1839. Today Hameshill is almost completely forgotten. Historic references thereto are commonly and wrongly attributed to Hames Hall (built 1846 and given its present name post 1871). ‘The Place-Names of Cumberland, Part 2.’ Armstrong, A.M., 1971. Cal. Inq. p.m. V, no. 560. D AY 1/2 (CRO Carlisle). ‘The Register of the Priory of St. Bees’, ed. James Wilson, Surtees Society, 1915. ‘A List of the Garrison at Carlisle Castle, 1383’, William Cook, C&WAAS Trans. Series III, Vol. VII. Cal. Inq. p.m. XVII, no.1247 (p 470). ‘Barwis of Cumberland’, Parts 1 & 2, Rev. F.B.Swift, C&WAAS Trans. New Series Vols. L&LI, 1950 & 1951. D AY 4/2 (CRO Carlisle). ‘The Registers of Bridekirk 1584 – 1812’, Haswell, Col. J.F., 1927. Will/Inventory of Thomas Brumfield Snr. of Bridekirk, 1631, CRO Carlisle. Will/Inventory of John Brumfield of Bridekirk, 1574, CRO Carlisle. Barwis, Richard (1602 – 1649) of Ilekirk Grange, Westward. www.historyofparliamentonline.org . ‘Visitations of the Plague in Cumberland and Westmorland’, Henry Barnes, C&WAAS Trans. Old Series Vol. XI, 1891. ‘Cumberland families and Heraldry’, Hudleston, C.Roy, 1978. Proceedings, C&WAAS Trans. New Series Vol. LXIII, 1963, pp 299-301. ‘Bridekirk and its Registers’, Wm. Browne Esq., C&WAAS Trans. Old Series, Vol. IV, 1878. ‘The History of the Congregational Church, Cockermouth’, W. Lewis, 1870. ‘The Cockermouth Congregational Church Book (1651-c.1765)’, Ed. R.B.Wordsworth, C&WAAS, 2012. Hearth Tax Returns for Cumberland, CRO Carlisle. ‘ A Perambulation of Cumberland 1687-1688’, Thomas Denton, Eds. Winchester, Angus J.L. & Wane, Mary, Surtees Society & C&WAAS, 2003. Q/11/1/25/1, Cumberland Quarter Sessions, 1693. CRO Carlisle. Numbers in left hand column refer to the original plan. Areas are in (statute) acres- roods-sq. perches, there being 40 sq. perches to a rood, 4 roods to one acre. 4. Gallabarrow/Hames Hill Wood, 0-3-13, wood. 5. Hutton Croft, 6-3-6, arable. 6. Hames Hill, 1-3-0, pasture and building (shed). 7. Hames Hill, 0-1-0, pasture. 8. Near Out Field, 7-0-26, arable. 9. Far Out Field, 7-1-20, arable and meadow. 10. Hames Hill House Meadow, 4-3-5, meadow. 11. Far Out Field, 0-2-30, meadow and woodland. 13. Snabs Meadow, 1-3-16, meadow. 14. Great Cow Hill, 13-3-10, arable. 15. Great Wood Head, 8-0-20, arable and woodland. 16. Hames Hill Wood, 3-1-29. 19. Hames Hill Wood, 3-1-1. 20. Little Wood Head, 5-1-4. 21. Hill Top, 1-3-36, meadow. 22. Sour Field Wood, 1-3-0. 23. Sour Field, 7-0-2, arable. 24. Little Cow Hill, 8-1-6, arable. 29. Captain Banks, 8-1-11, arable and meadow. 30. Trod Close, 3-3-9, arable. 31. Trod Close, 3-1-8, arable. 33. Wood Head Meadow, 3-0-21, meadow and arable. 35. Round Close, 1-3-23, arable. 36. Little Goodison, 1-2-3, arable. 37. Great Goodison, 3-0-20, meadow and arable. 38. Little Foul Flosh, 0-0-39, meadow. 39. Great Foul Flosh, 3-2-5, meadow and arable. 40. Green Gates, 7-0-25, arable. 1626 John, son of Thomas Brumfeild, baptism. 1649 Sara, dau. of Robert Hutton, baptism. 1656 John, son of John Parker, baptism. 1663 Bridget, dau. of Nicholas Tysen, baptism. 1663 Thomas, son of John Whinfield, baptism. 1665 Richard son of John Whinfield, baptism. 1666 Anna & Sarah, daughters of John Whinfield, baptism. 1666 Richard, son of Edward Stockdall, baptism. 1672 Anna dau. of Henry Tolson of Woodhall, witnesses Gulfrid Lawson esq., ‘Lady’ Huddlestone and ‘Lady’ (Elizabeth) Senhouse of H-H, baptism. 1672 George son of Thomas Bellman, vicar of Bridekirk, witnesses included Madam (Elizabeth) Senhouse of H-H, baptism. 1673 Peter, son of Patricius Senhouse of H-H, witnesses: Thomas Belman, vic; Henry Dalton, gent. ; ‘Lady’ Tolson of Woodhall, baptism. 1676 Feb 1st. Richard, son of Patricius Senhouse, baptism. 1676 Feb 5th. Richard, son of Patricius Senhouse, burial. 1678 Robert Fornasse of Papcastle and Jane Troughere of H-H, marriage. 1678 Margaret, relict of Robert Hutton, burial. 1688 Patrick, son of Mr. Barwise, baptism. 1704 John, son of Joseph Wren, baptism. 1708 Mrs Elizabeth Senhouse, burial. 1716 Joseph, son of Isaac Moore, baptism. 1733 Frances, daughter of Mr Senhouse, burial. 1742 ‘Young‘ Miss Senhouse, burial. 1757 Mary, dau. of Humphrey Senhouse, baptism. 1759 Humphrey, son of Humphrey Senhouse, baptism. 1763 Frances, dau. of Humphrey Senhouse, burial. 1764 Ann, dau. of Thomas Murgatroyd, baptism. 1764 Elizabeth dau. of John Etherington, baptism. 1781 Jane, dau. of James & Elizabeth Dowell, baptism. 1788 Sarah, dau. of Margaret Dowell, illegit., baptism.